Hey there is always hope. After half a century or so, hope is a little hard to come by. It was just announced that it is going to be checked out for artificial radio emissions by the Green Bank Radio Observatory. You can bet your brass that such work to some degree has already been done without a peep about it, whether they discovered something unusual or not. We have a lot of universe to look through. To say that anything exists or doesn't exist with any certainty is more arrogant than looking at a drop of water, extrapolating said drop, then declaring that there are no whales in the ocean, because there are no whales in your drop. That's a logical fallacy. What is actually happening is that we've done a fair amount of looking for life on other worlds, and "alien" life on our own planet and so far haven't found any. And looking at a whale-less drop of water and still hoping there are whales in the ocean is fine, but it in no way proves the whales. Statistical projections from the Kepler sampling are encouraging. This contradicted older theories which had suggested small and Earth-size planets would be relatively infrequent. Based on extrapolations from the Kepler data, an estimate of around 100 million habitable planets in the Milky Way may be realistic. Two of the reaction wheels on the Kepler that were used for inertial steering have failed over the years so I had thought the mission was essentially over. Much of the observable data is self canceling leaving only the interesting brightness anomalies. There was some unexplained dimming that was not attributable to any known source such as transiting. Some speculation that this might be an intentional alien signal. Even with many similar Earth sized planets of the same age it would be difficult to signal. Guess we will have to wait till Thursday for the announcement. Or find another game. Like, I don't know. The oceans? I think we are the only life in eternity apart from the dimension of the Elohim. So, in the entire history of a Universe so vast it boggles the mind, you don't believe there is other Life, but you believe in an invisible man in the sky who watches everything we do and judges whether we suffer for eternity or get rewarded. 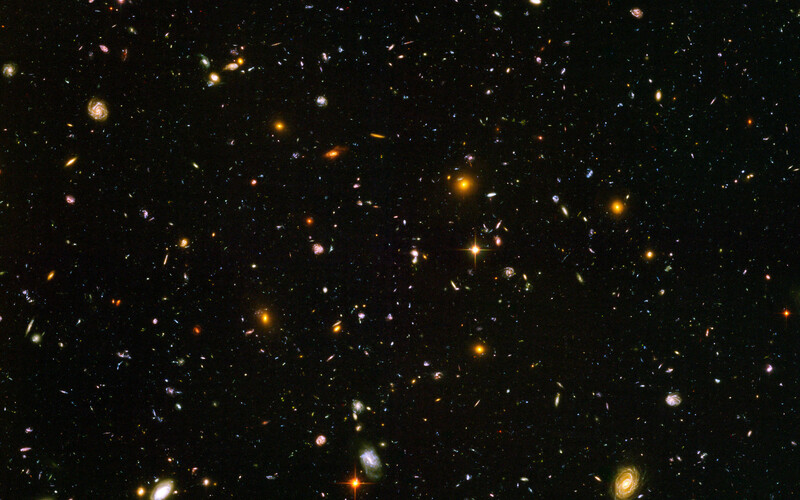 Hubble Ultra Deep Field. 10,000 Galaxies with hundreds of billions of stars and trillions of planets....but in all that, we're it, huh? Don't be so down on yourself. I don't consider you arrogant, just uninformed. Sheer numbers of worlds does not equate with increased probability of an extremely low probability event, which you have left undefined, by the way. o Space-faring sentient life to which we can relate on a human time-scale? Nope. o We are limited by the expansion of space-time to our Local group. In a few million years, the night sky will be almost black as the galaxies move away from each other. This is just the golden age of Astronomy. o Finally, most agree that Evolution does not select for intelligence. HTH. Go and be kind to yourself, do not fear one's own hubris my fren.